Furniture designers will tell you over and over: outdoor furniture is made for outdoor placement, but it isn’t invincible. 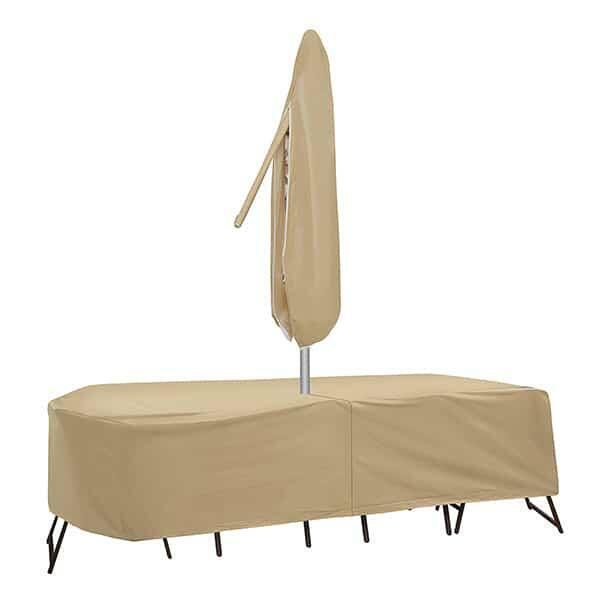 The best thing that outdoor furniture owners can do to protect their investment into outdoor furniture sets is: apply protective covers. It’s easy to do when the cover is designed like the options from PCI. One singular cover spreads atop an entire dining set: dining set, and a maximum of six high backed chairs. The furniture covers by PCI are meant to deliver a tailored fit that truly protects furniture from damages like water damage, UV fading, insect nesting and more. The cover is made with a two-step process. First, the outer 7 millimeter vinyl is treated to protect from UV rays, moisture, insects, dirt and more. Second, a 4 ounce fleece sheet is compressed and then laminated onto the back to protect the furniture from scratching and rubbing during non-use. Enjoy the ease of operation and the real results offered by PCI!